Sebastion and his mother, Jamie, were standing a few feet from the edge of a seaside cliff last November when each bent down to pick up rocks to throw into the ocean. As the 4-year-old Santa Rosa boy stood up, he tottered forward and began to fall over the edge. His mother dove to catch him, but missed his hood by a few inches. Terrified, she watched him “tumble and bounce and roll” down the face of the daunting 230-foot cliff. As daylight faded, rescuers rappelled down, getting help from illumination flares fired from a nearby Coast Guard lifeboat. To everyone’s surprise, Sebastion was alive. He was found lying at the bottom of the cliff and was pulled back up to safety. Heavy fog prevented helicopter crews from airlifting him from the beach, so he was taken by ambulance to Santa Rosa Memorial Hospital, then transferred to UCSF Benioff Children’s Hospital Oakland for specialized care. As one of only five ACS Level 1 pediatric trauma centers, Children’s has one of the most experienced trauma teams in the Bay Area. “When he came in he was pretty badly injured. The most concerning thing was his head injury,” said Christopher Newton, MD. Sebastion suffered shear force trauma, a type of brain injury caused by rapid acceleration or deceleration of the head, similar to shakenbaby syndrome. He underwent surgeries on his leg and arm, received two blood transfusions, and was put in a medically induced coma to keep him from going into shock. His recovery has also involved ongoing speech, physical, occupational, and music therapies, as well as psychiatric counseling. 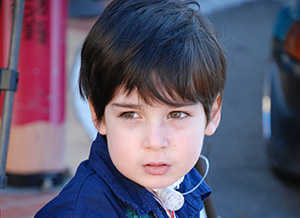 Now back at home, Sebastion has come a long way since his devastating accident. There’s still a long road ahead, but his family feels extremely grateful for the quality care that he has received. “My son wouldn’t be alive without this hospital, wouldn’t be thriving without the therapies and the team to support him,” shares his mother Jamie. Although it’s apparent soon after meeting Sebastion that he’s a very special boy, his positive, bounding energy belies all this miracle kid has been through.